None. Annual vinca grows best in warm weather. Celosia. These heat-tolerant bloomers make good bed partners for taller marigolds and zinnias. They also grow nicely in pots. Sow seeds indoors in late spring and set plants out after the last frost has passed. Seedlings are widely available as bedding plants in late spring. Vinca sheds its flowers cleanly, so it rarely needs trimming. 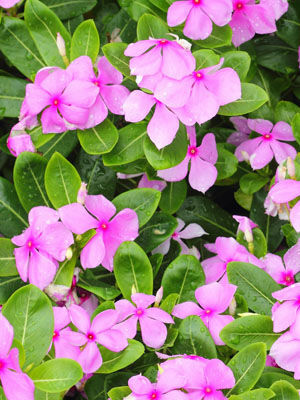 Do not plant vinca in the same soil repeatedly, because this can lead to problems with root rot diseases. Colors include white, red, pink, lavender and a few bicolors. These low-maintenance flowers require little care. A root rot that causes mature vinca plants to collapse and die suddenly has become common in warm climates in the US.